On September 27, 2007, NASA launched its Dawn spacecraft. Its mission is to orbit the asteroid Vesta and then head over to another asteroid, Ceres. Both Vesta and Ceres are situated in the asteroid field between Mars and Jupiter. Dawn's goal is to investigate in detail the two asteroids which are the largest protoplanets still intact. Protoplanets are small celestial bodies that show the beginning formation of a planet. These are differentiated objects which means, that these protoplanets underwent a process where their interior got hot enough to melt separating elements within into layers. 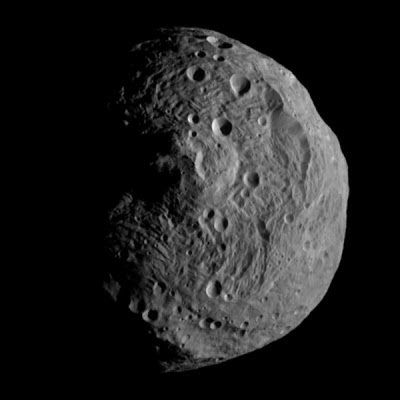 Vesta is a dry, differentiated object that has a rocky surface which resemble some features found on the Earth. Last year, data from the Dawn mission revealed that Vesta may be the smallest terrestrial planet in the solar system. Meteorites found on Earth believed to have come from Vesta has shown extensive igneous processing not much different from the magma rocks found on Earth. This process makes them closely resemble terrestrial igneous rocks. Last month, the Dawn spacecraft left Vesta is now on its way to rendezvous with the recently categorized dwarf planet, Ceres. About 4.6 billion years ago, the solar system was little more than a tenuous disk of gas and dust. In the span of merely 10 million years, this soup evolved to form today’s massive, complex planets. In the intervening period, however, the solar system contained a mixture of intermediary bodies — small chunks of rock, the remnants of which today are known as asteroids. Although not much is known about the early composition of asteroids, some scientists suspect that such information may reveal an unexpected diversity of planetary bodies within the early solar system. Now a new study published this week in Science has found evidence that Vesta, the second-most-massive asteroid in the solar system, once harbored a dynamo — a molten, swirling mass of conducting fluid generating a magnetic field — resembling that in much larger planets like Earth. Researchers at MIT say the findings suggest that asteroids like Vesta may have been more than icy chunks of space debris. Most or all of the planets in the inner solar system are thought to have generated dynamos at some point in their histories. In a dynamo, molten-hot iron flows within the core, generating a magnetic field that may last for millions of years. As a result, the rocks on the surface of a planetary body become magnetized, providing a record of a planet’s early history. Scientists have attempted to characterize the magnetization of meteorites — remnants of asteroids that have fallen to Earth — in order to reconstruct asteroid evolution. But a major challenge has been pinpointing the source of meteorites’ magnetization, which may be formed by any number of processes — such as plasmas from a meteoroid impact, or more mundane causes, like passing a magnet over a meteorite sample. Determining that a meteorite’s magnetic field is the result of an early dynamo is therefore a tricky problem. To solve the problem, Fu and Weiss collaborated with researchers at the University of California at Berkeley, first to determine the magnetization and the age of a meteorite sample, then to check that the observed magnetic field was, in fact, due to an early dynamo. An electron micrograph image of a meteorite sample from the asteroid Vesta. Dark, finely striated regions represent rapidly cooled material. Light-colored crystals represent a second slower-cooling period, in which an ancient dynamo may have resided. The group obtained a meteorite sample from Vesta that was originally discovered in Antarctica in 1981. The 50-gram sample, named ALHA81001, retains exceptional magnetic properties that scientists have been examining for years. Fu and his colleagues managed to acquire a one-gram sample of the rock for analysis. The team first examined the rock’s tiny crystals. When forming in a magnetic field, a rock’s ferromagnetic crystals align in the direction of a background field when the rock is heated. The group measured the alignment of these minerals, or the rock’s magnetic “moment.” The researchers progressively demagnetized the rock until they found the magnetization that they believed to be the oldest remnant of a magnetic field. The group’s next step was to determine the age of the rock. To do that, UC Berkeley researcher David Shuster analyzed the meteorite for evidence of argon. An isotope of argon called argon-40 is produced from the natural decay of potassium-40. A common technique for determining a rock’s age is to heat the rock and measure the amount of argon-40 released: The more argon-40, the older a rock may be. Through this technique, the researchers determined that the Vesta meteorite is 3.7 billion years old. However, because Vesta formed 4.5 billion years ago, any early dynamo must have decayed by the time the meteorite now known as ALHA81001 formed. So what is the origin of the field that magnetized this rock? Fu and Weiss believe that an early dynamo likely magnetized the surface of Vesta within the first 100 million years of the asteroid’s history, magnetizing surface rocks that then persisted over billions of years. 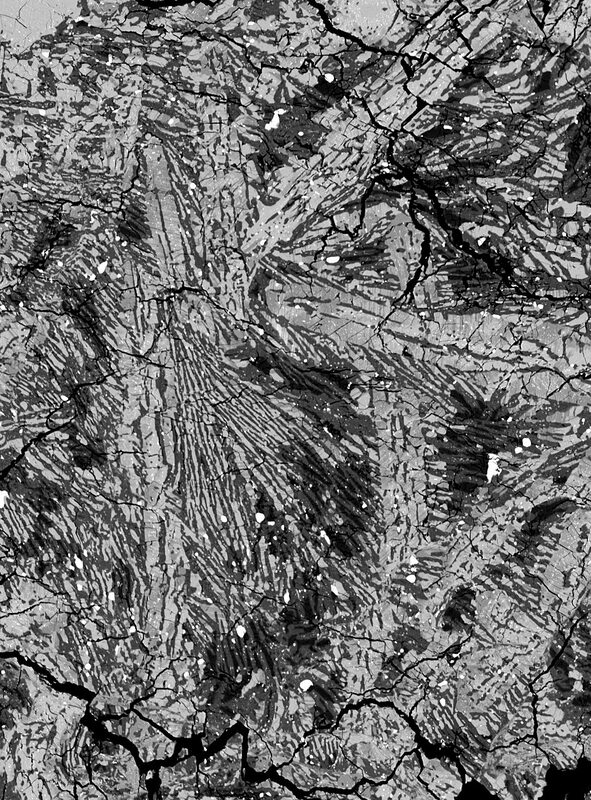 When ALHA81001 formed 3.7 billion years ago, it would have also become magnetized due to exposure to fields emanating from the surrounding crust. Could the magnetization of Vesta’s rocks have been caused by anything other than a dynamo? To rule out other scenarios, the group analyzed the crystals in the meteorite sample to determine the rock’s cooling history. While large impacts might create a magnetic field, such impact-generated fields would only last a few tens of minutes, according to Fu — and if a rock were to become magnetized in such a short period of time, it would also cool equally quickly. 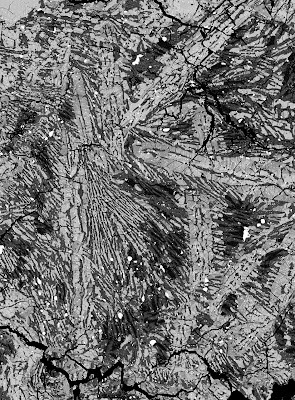 To determine the cooling history — and therefore the magnetization period — of the meteorite sample, the group examined the tiny crystals on the rock’s surface — a technique developed by Timothy Grove, a professor of geology at MIT and a co-author of this week’s Science paper. They found that the rock experienced two periods of cooling: an initial rapid cooling, which produced fine crystals with excellent magnetic recording properties, followed by a much longer period of cooling. This longer cooling phase, Fu believes, is proof that the magnetic field observed in the rock is likely due not to an impact, but to a longer-lived field such as that expected for a dynamo.